Summer has now left Alberta and replaced it with a record setting 32.8cm snowfall on October 2! YUCK! Now that my palate is naturally craving the warmth of red wine, it's time to wrap up my Cremant Tour de France mini-series. The last stop? Burgundy. Burgundy 's homeland grapes are the same as the varietals required for crafting Champagne: Pinot Noir and Chardonnay. In fact, the Cremant de Bourgogne appellation takes their vinification seriously: only hand-harvesting the grapes, utilising the same pressing process as in Champagne, and you must declare your production of Cremant in March, just before the growing season begins! The fruits of these labors are evident in the glass: elegantly structured, refined in style, and punches well above their weight when it comes to QPR! I kicked off the warm weather season this year with Henri de Villamont Brut Blanc de Blancs. Composed solely of Chardonnay, this wine boasted abundant autolytic flavours of toasted hazelnuts and brioche, with an appealing hint of banana custard towards the long finish. Bright and lively mouthfeel, I enjoyed it immensely on its own! The Bailly Lapierre Cremant de Bourgogne contains an intriguing blend of Pinot Noir, Chardonnay, Aligote and Gamay Noir, creating a palate of green apple, stony minerality, and freshly baked bread. Surprisingly delicate bubbles, but a bright acidity and citrus finish keep a well-structured balance. An excellent choice for weeknight bubbly! The final bottle of my Cremant Tour de France was the same as my first glass ever of Cremant: Louis Bouillot Rose. Prominent notes of strawberries, raspberries and mandarin oranges, refreshing acidity, a bright mouthfeel and a true joy to sip! I prefer to enjoy this gem on its own-over, and over, and over again! I truly enjoyed tasting my way through the Cremants of France, no matter what appellation they are from! They are an excellent alternative to Champagne when you don't want to spend a fortune, and pair extremely well with an array of food. The next time you feel like imbibing in bubbly, why not give a Cremant a try? You won't be disappointed. I would love for you to share your Cremant tastings with me, either by commenting on this post or through the hashtag #cremanttourdefrance on twitter. I hope you enjoy your sips as much as I enjoyed mine. Until next time, cheers all! Now that Stages 1 & 2 of my Cremant tour de France are complete, I celebrated Stage 3 by tasting my way through the Cremants of Alsace, in person! Located on the eastern border with Germany, Alsace contains 15,621 hectares of vineyards. (Source: backinalsace.com). Approximately 23.3% of grapes harvested from the vineyards are used to make Cremant d'Alsace bubbly. In 2017, 32,125 bottles of Cremant wine were made, 80% of which remained in France due to domestic demand! Our first stop along our tasting journey was Domaine Klipfel, in the small town of Barr. The estate was founded in 1824 by Martin Klipfel. In 1830, he procured the prestigious Clos Zisser vineyard, which is used today for their Vendage Tardive (late-harvest) and Selection de Grains Nobles (grapes affected by "Noble Rot", botrytis, made into lusciously sweet dessert-style wines). Klipfel crafts their Cremants in the Methode Traditionelle style, using Chardonnay and Pinot Noir either as single-varietal bottles, or a mix of the two. Klipfel's Blanc de Noirs Cremant d'Alsace opens up with a nose of green apples and continues into a palate of lemon zest and steely minerality. The bubbles were aggressive up front, but settled down into a creamy mousse mid-palate, leading into a clean finish. I am all about the high quality and the unique, sometimes extraordinary quality that comes from smaller, lesser-known producers. Located in the small Alsatian town of Heiligenstein, Domaine J.L. Schwartz lives up to this quality! Our tasting at J.L Schwartz started off with their Cremant d'Alsace Brut Rose. A lively bouquet composed of strawberries and navel oranges, intertwines with refreshing acidity and delicate mousse on the palate to create a delightful mouthfeel. Unfortunately, the finish dropped off rather quickly, but it did make me want to take more sips quicker to compensate! The standout Cremant of the day for both my husband and I was the Brut Chardonnay! The varietal's flavour profile is well represented here, with an intriguing blend of underripe banana and navel oranges along with stony minerality. There is a lively mouthfeel that doesn't overpower, full of delicate mousse and refreshing acidity. Very elegant in style, and very approachable! Our day of Cremant tasting ended at Domaine Julien Dopff au Moulin. Regarded as one of the pioneers of Cremant d'Alsace, Julien Dopff attended the Universal Exhibition in Paris in 1900, where he learned about "Methode Champenoise". He made it his mission to experiment with Alsatian varietals, and Dopff au Moulin now dedicates a considerable amount of their wine portfolio to Cremant d'Alsace bubbly. The Dopff au Moulin Rose expresses more autolytic notes than other Cremants d'Alsace I have tasted. But it doesn't overpower the abundant flavours of underripe red fruit on the palate, the creamy mousse, or the bright acidity. Very well-structured and refreshing! Finally, the 2013 Blanc de Noirs Brut marries notes of dried red fruit and toasted almonds with crisp acidity and aggressive, but not off-putting mousse. Very elegant in style, and very food-friendly. Cremant d'Alsace offers a variety of sparkling wine created in the Methode Traditionelle, yet can also express a wide array of flavour profiles. There are many excellent Cremants available throughout the world, and even though only 20% of all bottles are exported, you will likely find a variety of Cremants available in your local wine stores. Stay tuned as I wrap up my Cremant Tour de France later this month with Cremant de Bourgogne! When I started my wine education journey, I was in love with Pinot Noir. Almost every wine I purchased was Pinot Noir. But as I began to learn about Burgundian wine, I realized that I couldn't afford most everything outside of AOC Bourgogne. I became frustrated and abandoned my love for Pinot Noir. In fact, I was so frustrated that I almost wrote a blog post about why Burgundy turned me off of Pinot altogether! Some of the people I discuss wine with on Twitter (aka my "Tweeps") have been drinking a lot of Pinot Noir lately, much of it from New World regions like New Zealand and California. Their tasting notes inspired me to revisit more affordable Pinots, and where better for me to start than my personal favourite, the Okanagan region of Canada! There are 7 sub-regions within the Okanagan Valley: Osoyoos, The Golden Mile Bench, Oliver, Okanagan Falls, The Naramata Bench, Peachland/Summerland, and Kelowna/Lake Country. Each sub-region reflects different nuances with respect to climate and terroir; therefore, the flavour profiles of Pinots from each sub-regions will likely express themselves differently. I set out to discover how each Pinot Noir expresses itself within most of these sub-regions. Located close to one of the only desert micro-climates in Canada, I was intrigued to see how the "diva grape" would fare in a terroir consisting of deep, sandy soils fed by glacial meltwater deposits. I was pleasantly surprised! 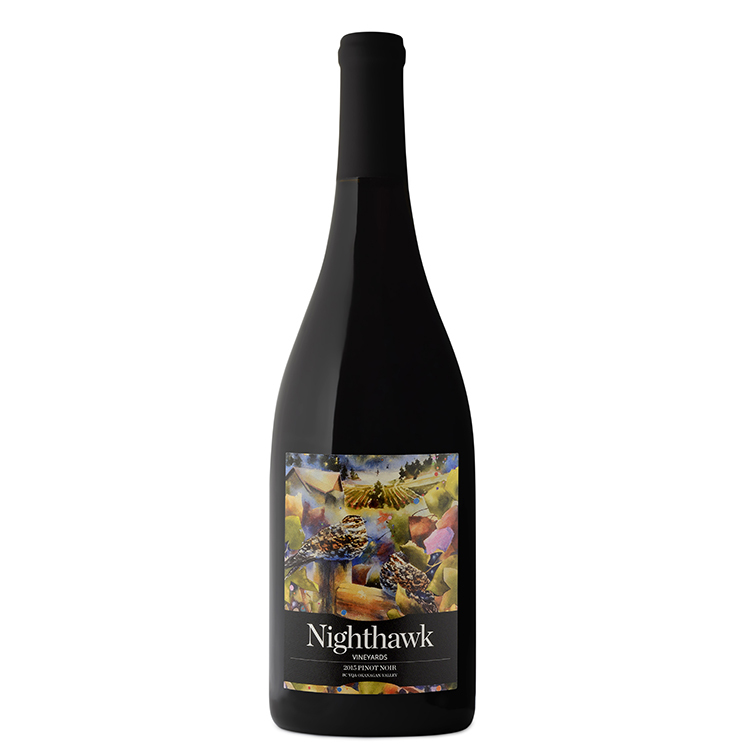 Approachable yet complex and elegant in style, Burrowing Owl's 2015 Pinot Noir opens with notes of wild strawberry, dusted with hints of fresh herbs and baking spice. A silky smooth body leads into a bright cranberry finish. The wine was an amazing pairing with mushroom and garlic burgers with caramelized onions and wilted spinach! "This medium-bodied Pinot is as smooth as velvet. The estate Pinot Noir features delicate hints of ripe cherries and raspberries, vanilla bean, and the minerality distinctive to the high-altitude Okanagan Falls vineyard. Finished in Tuscan concrete tanks creating a textured savoury mouthfeel. My favourite pairing is with BBQ salmon. 13.5% alcohol." A soil composition of lime-rich silt and cooling lake breezes on the Naramata Bench create an ideal climate and terroir for early ripening red grapes like Pinot Noir. Bench 1775 uses this to their advantage by crafting a refreshing and juicy Pinot, abundant with red fruit flavours and silky, fine-grained tannins. A small amount of Syrah (6.4%) adds in a spicy element, which you'll find from mid-palate through the lively finish. I enjoyed this Pinot on it's own, and plan to enjoy it again and again in the future! "Alcohol 12.5%, pH: 3.68, TA: 5.3g/L. Hand harvested in October from Dijon clones 114, 777, and 828; sorted and co-fermented in small lots. After a gentle pressing, the wine was aged in large format barrels. This is a bold Pinot Noir, the result of the hot 2015 East Kelowna summer. Aromas of violets and jammy plum and flavours of ripe raspberries and spicy black cherries. The texture is silky." The soil in the Ex Nihilo vineyards contain limestone with some shale, ideal for the growth of Pinot Noir grapes. Ex Nihilo's 2016 PN offering boasts complex aromas of red fruit, forest floor, and a hint of asparagus. These flavours continue into the palate, along with silky smooth tannins and refreshing acidity with a hint of zip. This acidity stays bright through the fresh raspberry finish. This wine is extremely food friendly and would be an excellent pairing with tapenade-stuffed pork tenderloin, among other earthy style dishes. I sampled this beauty at the winery last August. Click here to learn more about Ex Nihilo Vineyards, winemaker Jay Paulson, and their wine portfolio. It was very interesting to discover that each sub-region shows a slightly different flavour profile on their Pinot Noirs, but the structural consistency and quality remains very high throughout the Okanagan wine region. Price points range between $30 and $40 CDN, but worth the slight splurge! It's nice to know that I can still taste some excellent Pinot Noirs close to home with some great QPR. So what's next for the Wine Concubine? I tasted a wide variety of red wines from the Southern Rhone throughout the past month when my dad came to visit. I'll be sharing our notes, and revealing our surprise favourite of the tasting. Stay tuned! Every once in awhile a bottle of wine will come along and stop you in your tracks, take your breath away, and make you want to hug or compliment the winemaker (if you happen to find yourself in their presence). This mind-blowing moment happened to me in late February, when I tasted Ex Nihilo's Merlot at our local Winefest trade show. I still remember it's lush flavour profile of ripe red fruit and smoky undertones, it's smooth mouthfeel and racy finish. It turned out that Jay Paulson, the mastermind behind the bottle, was there and not only did I compliment him, I also hugged him to show my sincerity! Meaning "Out of Nothing", the name Ex Nihilo winery was inspired by a sculpture bearing the same name on the Washington, DC, Cathedral. Jay, along with his lifelong friend Jeff and wife Decoa, ventured into Lake Country, BC in 2003, and purchased 10 acres of land in 2004. The first vines were planted in 2007, and the winery officially opened in 2010. A former cattle rancher, Jay was thrown into the chaos of winemaking. With that said, sometimes the greatest things come out of chaos, and the wines crafted by Jay are all an excellent example of that. Although I tasted the majority of the 2015 wine portfolio, I'm providing the notes for my favourite wines of the tasting...or else I'd be writing forever! The 2015 Chaos Bianco carries notes of apple jelly, honeysuckle, and lime curd framed by spicy acidity and a long, sultry finish. A well-structured blend of 50% Riesling, 25% Gewurztraminer and 25% Pinot Gris, this gem pairs well with mild curries, pasta primavera and light cheeses. Thanks to cooling lake breezes and shale-like soils similar to Burgundy, Pinot Noir grows very well in Lake Country. The 2015 Pinot Noir Reserve opens with aromas of cherry preserves that carry through to a spicy palate of forest floor and vanilla, due to aging in 30% American oak. The plush mouthfeel continues through the elegant finish. And of course, the 2015 Merlot stole my heart with an ever-evolving flavour profile of ripe red fruit, black cherries and a hint of charred cedar. Cocoa tannins and racy acidity round out the smooth, full body, ending in a long, complex finish. I paired the Merlot with a heart of dark chocolate, and it seriously melted my actual heart! The full body of the Merlot complemented the weight of the dark chocolate perfectly, and the succulent mouthfeel married beautifully with the cocoa notes in the chocolate. If you find yourself in Lake Country, BC, make sure to stop by Ex Nihilo for a tasting and perhaps even a bite at the Chaos Bistro. I promise, you won't be disappointed! My sincere and humble thank you to Jay Paulson for setting up an amazing afternoon of wine tasting, food pairings, and excellent conversation. This is a day I will cherish as long as I live. Despite all the different varieties of wine I drank this year, I wanted to finish 2013 with my favourite varietal, Pinot Noir. North American wine regions have been known to offer some excellent New World Pinots: Oregon and California are the most popular regions, and both Niagara and the Okanagan are also producing quality wines from this varietal. I decided to focus on the 2010 vintages of Californian and Okanagan Pinot Noirs, to see how rough growing seasons affect the wines. The comparison was done via a 4-wine flight: two Pinots from California to start, and two from BC to finish. Both California and Okanagan producers were faced with a challenging growing season. Spring arrived late in both regions, with record low temperatures and exceptionally high rainfall in May (BC). Summer finally arrived in California in August, and extremely high temperatures frequently broke records. Winegrowers that chose to expose their grapes by trimming the canopy (leaves) when sunshine levels were low in the spring, were now dealing with opposite conditions and sun burnt grapes. The low temperatures in the Okanagan continued through the summer, and higher than normal rainfall amounts were recorded in the first half of September. The weather finally turned favorable at the end of the month, and a long, dry Autumn settled in to save the crop. Despite the challenging growing season, both California and the Okanagan were able to produce quality wines due to a more meticulous sorting process, ensuring only healthy grapes were fermented. These healthy grapes showed a surprising vibrancy in both colour and flavour profile that translated into the final wines, with elegant structure and earthy tones characteristic of a good Pinot Noir. The Kendall Jackson Vintner's Reserve 2010 is surprisingly complex, featuring a vibrant bouquet of rhubarb, red fruit, damp earth and a subtly steely minerality. Well structured with refreshing acidity and fine tannins, this wine is food friendly but also easy drinking on it's own. An ideal match for a summer BBQ, pizza and fun nights with friends. La Crema's 2010 Monterey Pinot Noir shows even more complexity with a flavour profile that includes strawberries, white pepper, wet leaves and black olives. There is more earthiness in this vintage than it's 2009 counterpart, which was more fruit-forward thanks to the excellent growing season that year. It also contained the same level of acidity and fine tannins that the Kendall Jackson had, with more intensity. This wine is great for a dinner party and for relaxing the mind after a long day! The Thornhaven 2010 Pinot Noir showed the highest acidity level of the four wines: a crisp, mouth-watering bite that doesn't overpower the structure and lasts well into the long finish. It has a similar flavour profile to the Californians, with aromas of raspberries, white pepper and forest floor. Smooth and seductive with silky tannins, it will pair well with a fireplace on a cold winter's night and when romance is in the cards! This is also a food friendly wine that would make a fine match for pork dishes. Lake Breeze's Seven Poplars Pinot Noir 2010 was the most fruit-forward of the flight, with juicy notes of strawberries and raspberries. There was a subtle earthiness in both the nose and palate, but not as apparent as in the other wines. The wine also contains light, silky tannins and a lower acidity level than the others, making this Pinot easy to drink in the Spring or Summer and would pair well with chicken and berry salads. I found that all four Pinot Noirs in the flight contained higher acidity levels and more earthiness than other vintages, which may speak to the damp earth the grapes dealt with for much of the growing season. There was also a subtle minerality in some of these wines that I haven't seen in other Pinot vintages, adding complexity to the palate. Each wine showed a vibrancy in the flavour profile, reflecting the great care each winery took to ensure the best quality of wine despite the growing season's challenges. With all of that said, each wine shone individually and all 4 are approachable, versatile and food-friendly, all at the mid-priced range ($20-$40 CDN) making them great value. Just because a growing season is labelled as challenging by winemakers and experts, does not mean the wine will necessarily suffer. As long as great care is taken in the vineyards and during the winemaking process, a good wine can still come out of the surviving grapes-just like the Phoenix rising from the ashes! -Pinot Noir grapes are the divas of the vineyard. They flourish best in a temperate climate; too much heat and the berries can shrivel and get sun burnt. The grapes are also very susceptible to mildew, botrytis and virus diseases. This also explains why Pinot Noirs tend to cost more than other wines. -Although the wines do have red and black fruit on the nose and in the palate, Pinot Noirs are full-bodied wines that are mostly earthy, with more mineral and herbaceous notes than fruit. I also found a subtle note of black or white pepper on a lot of the wines I tasted. -There is a special glass to best taste Pinot Noirs with that has a slightly flared rim. A picture of it can be found in one of my previous posts. -I found Pinot Noirs paired best with beef and lamb dishes. As mentioned, Pinots are full-bodied and hold up against the stronger flavors of the beef and lamb. The New Zealand Pinot I tasted paired really well with a smoked Gruyere cheese. Go for stronger flavors when pairing a Pinot, but feel free to drink it on it's own, especially a wine from California's 2009 standout vintage. California: 2009 all the way! The climate conditions were perfect for growing Pinots. My "silver medal winner" is from this vintage! Sadly, I found Italy on a whole to be a miss with Pinot Noir. They specialize in their own grapes for a reason, and I'll be sure to sample them soon, especially with my return to WSET Advanced in the Spring. Gold: Chateau des Charmes Old Vines PN 2007. There was a party in my mouth when I first tried this gem! Full-bodied, spicy, a little herbaceous but a beautiful long finish that doesn't leave a harsh aftertaste in the mouth. It made me want more, and more, and more...4 bottles are now in my cellar. I paired it with meat but could drink it on it's own as well! Silver: La Crema Monterey PN 2009. I love this wine because it has more abundant red fruit on the bouquet and in the palate than in other Pinots. I found this one to be very easy-drinking, with all the characteristics of a Pinot Noir on the palate. My favorite to drink on it's own! Bronze: Louis Latour PN 2009. If you want a good benchmark Pinot from it's homeland of Burgundy, you can not go wrong with this one! I tasted notes of black pepper, bell pepper, eucalyptus, with hints of coffee and meat. Another full-bodied, long finish wine. A great choice! Best Pairing: Veuve Clicquot with Rack of Lamb Persillade. Because Pinot Noir makes up only a part of the composition in Champagne, I was surprised that it stood out against the harsh, bitter flavors of the lamb! The delicate flavors of the Champagne complemented the lamb in such a way that I couldn't take a bite of meat without savoring a sip of wine in my mouth right after! So that's it. Although the blogging portion of the project is now complete, I don't expect to stop drinking Pinots altogether, which is why the project will never officially end in my life. Besides, I've only scratched the surface! Cheers to the Pinot Noirs I will continue to taste in the future! So what's next for 2013? I will be taking on 2 projects; the first is a cellar-based project thanks to my darling husband. I will be tasting 4 wines, and then cellaring the bottles to see how they age. This one will take a few years (if not longer) to complete and will lead into the 2nd project, a research-based project on the wines of Penfold's. Stay tuned for the tasting notes! Imagine this scenario: You've been married for seven years, a young wife at 27 years of age. Suddenly, your husband passes away. You are now a widow, or "veuve" in French. What would you do? One would obviously be devastated, and of course there would be a necessary period of mourning. Would you struggle to get out of bed on a daily basis? Would you somehow find the inner strength you need to try and move on? Barbe Nicole Ponsardin found herself in this situation back in 1805 when her husband passed away. Fortunately, she made the choice to take over the family business. This decision ended up being such a great decision as she would bring the world one of the most prominent champagnes well recognized everywhere! Veuve Cliquot Ponsardin's grapes are grown over 382 hectares in the vineyards surrounding Reims, France-the 2nd largest vineyard in the Champagne area. Of the total grapes they grow, 39% is Pinot Noir grapes, 46% is Chardonnay, and 15% are Pinot Meunier. Veuve Cliquot prides themselves on having a 97% vineyard rating based on the echelle des crus, a classification system for vineyard quality in Champagne. You can taste the quality in their bottles! The grapes are harvested only when the perfect balance between sugar & acidity in the grapes is reached. Harvesting is done by hand and the different grape varieties remain separated until the blending process. Veuve Cliquot presses 2550 litres of juice from 4,000kg of grapes. The first 2,050 litres are called the cuvee and the last 500 litres are called the taille. Fermentation then takes place in stainless steel vats. Blending then takes place to maintain the house flavors and quality. The wine is bottled and sugar and yeast are added for secondary fermentation. Veuve Cliquot ages their bottles in their cellars in Reims for no less than 15 months as part of the Champagne A.O.C. regulations. The bottles are laid in riddling racks (shown below) that were actually invented by the house to make the process of disgorging (removing the sediment in secondary fermentation) easier. The bottles are turned and tilted slightly to move the sediment to the neck of the bottle. When the aging process is complete, the sediment will be frozen and the pressure inside the bottle will literally push it out when the cap is removed. After a small amount of sweetened liquor is added to the champagne, the bottles are corked and wired and laid down on their side in the cellars to further develop flavor before being labelled and packed up for shipping. My husband and I were fortunate enough to get the chance to visit this prestigious champagne house in mid-March. We were given the chance to see the cellars, learn their history and taste a few of the champagnes as well. We tasted the yellow label and the 2002 vintage, which I found light, lovely, and really easy to drink! Needless to say, there is a bottle of the yellow label in our house now too! www.veuve-cliquot.com, they mention a hoax promotion that is being offered for a free case of their champagne. To me, that speaks volumes of the quality and reputation that Veuve Cliquot maintains all over the world. After all, imitation is the best form of flattery, n'est-ce pas? One of the things I love best about Veuve Cliquot (outside of the taste & quality of course!) is what they do for women. It's a tough life for a woman, working in a predominantly men's world. I experience this first-hand every day as I work with all men in the aviation industry. Veuve Cliquot hands out Businesswoman of the Year awards every year to outstanding businesswomen who embody the values of Madame Cliquot. Sixteen winners will be crowned for each of the countries that participate in the award, and the winners receive a trip to Reims to christen a vine in their own names, one each, at the International Business Woman Forum! On top of that, on their birthday every year of their life they will receive a bottle of a champagne from that vine. Amazing! Although internet rumors insist there is a jinx or curse on winning the award, I think it's great to see recognition of successful women on a worldwide scale.